Symbols have been used in architecture and art by the Christian church since the earliest ages for many reasons. Symbols served as a secret sign among the faithful during times of persecution. Symbols were also a means of teaching biblical truths to those unable to read. Symbols remind believers of God's sovereignty over all creation. Symbols also serve as a means of memorializing God's divine activity in human history. 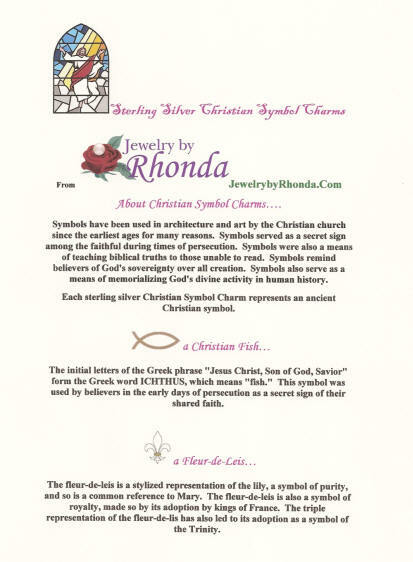 Each Sterling Silver Charm on this page represents an ancient Christian symbol. Have fun learning and sharing! Yes, you can use Christian Symbol Charms for your charm cake/cake pull event. Request with your order: satin ribbons and a personalized description card. 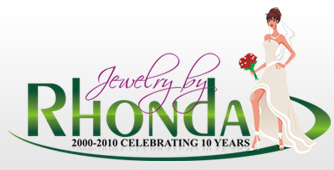 Create a unique Sterling Silver Charm Bracelet for someone special (or for yourself)! Bell Charms The Bell symbolizes the call to worship and proclamation of the gospel to the world. Butterfly Charms The Butterfly symbolizes the Resurrection. The beautiful butterfly rising from the seemingly lifeless chrysalis of the ugly caterpillar reminded early Christians of the new life that is ours in Jesus Christ. Christian Fish Charms The initial letters of the Greek phrase "Jesus Christ, Son of God, Savior" form the Greek word ICHTHUS, which means "fish." This symbol was used by believers in the early days of persecution as a secret sign of their shared faith. Christian Flag Charms The Christian flag was designed by Charles Overton in 1897. The red Cross stands for the Christian faith, God's love for man and the promise of eternal life. The blue represents Christ's faithfulness unto death. The white ground signifies purity, innocence and peace. Church (Steeple) Charms The Church Steeple on top of the sanctuary directs people's attention to God in heaven as they enter to worship. Modern steeples are a remnant of Gothic architecture of the Middle Ages with its pointed arches and soaring spaces that seem to lift the human spirit heavenward. A steeple may be topped with a cross that can be seen for miles around as a constant witness to Jesus Christ. The steeple may have come from ancient bell towers - bells were lifted above the landscape so that people could hear the call to worship. Today, many steeples also contain bells and serve both functions. Daisy Charms The Daisy is a 15th century symbol of the innocence of the Christ Child. The daisy, less exotic and pretentious than the lily, was thought by some to be a more fitting symbol for the baby Jesus. Dogwood Flower Charms The Dogwood is a modern figure of the Passion of Christ. The "legend" of the dogwood, which once grew tall and straight, was the source of the wood used for the cross. Jesus had pity on this poor tree used for such an dastardly purpose and decreed, "From now on the dogwood tree shall be slender and bent and twisted. Its blossoms shall be in the form of a cross - two long and two short petals. In the center of the outer edge of each petal there will be nail prints, brown with rust and stained with red. The center of the flower will be a crown of thorns. All who see it remember it was upon a dogwood tree I was crucified and this tree shall not be mutilated or destroyed, but cherished as a reminder of My death upon the cross." Dolphin Charms The Dolphin is one of the most common "fish" (the dolphin is actually a mammal) found in Christian art. Dolphins are often seen swimming alongside ships - from this, they came to represent Jesus Christ, who guides believers to heaven. Dolphins were the "fish" often used to portray the story of Jonah and by extension, came to be symbolic of the Resurrection. Donkey Charms The Donkey is an animal symbolic of humility, peace and Davidic royalty (a donkey was a princely mount before the horse came into common use - the royal mount used by King David and his sons was a mule/donkey - see II Samuel 13:29). A donkey that had never been ridden was also appropriate for sacred purposes. Fleur-de-Leis Charms The Fleur-de-Leis is a stylized representation of the lily, a symbol of purity, and so is a common reference to Mary. The fleur-de-leis is also a symbol of royalty, made so by its adoption by kings of France. The triple representation of the fleur-de-lis has also led to its adoption as a symbol of the Trinity. Jerusalem Cross Charms This complex form is composed of a central Cross made of four tau crosses representing the Old Testament law. The four smaller Greek Crosses represent the fulfillment of the law in the gospel of Jesus Christ. Another interpretation is the representation of the missionary work of the church - spreading the gospel to the four corners of the earth. The five Crosses can also represent the five wounds of Christ on the cross (hands, feet and side). The Cross appeared on the coat-of-arms of Godfrey of Bouillon, the first ruler of the Latin Kingdom of Jerusalem. Lamp/Lantern Charms The Lamp is most often used to represent the Word of God. It may also be used as a symbol of wisdom taken from the parable of the ten virgins in Matthew 25:1-13. The lamp was associated in the Old Testament with worship, where it symbolized God's presence. A lamp can also represent the Holy Spirit. Nails Nails were an instrument in Jesus Christ's crucifixion. Three nails symbolize the Holy Trinity and identify Jesus Christ as the second person of the trinity. Oak Leaf Charms The Oak was adopted by Christians to represent steadfastness and endurance, especially in the face of persecution. The oak was one of the trees traditionally believed to have provided wood for the cross. Peacock Charms The Peacock is used in Christian symbolism as a sign of immortality because of the myth that a peacock's flesh does not decay after death. Pelican Charms There is a legend that in times of famine, the mother Pelican plucks open her breast and feeds her young with her own blood. During the 13th century, the Pelican became widely used in Christian art to represent Jesus Christ's voluntary sacrifice of atonement for our sins. Phoenix Charms An ancient myth held that the beautiful Phoenix, which lived in the Arabian desert, lived to be five hundred years old and then set its nest on fire and was consumed in the flames. After three days, the phoenix rose again from the ashes, restored to youth, to live another five hundred years. Early Christians saw in this tale a symbol of the Resurrection. Saint Clement related the story during the first century in his first letter to the Corinthians. The phoenix was used to symbolize resurrection generally at first, and gradually came to signify the Resurrection of Jesus Christ. Quatrefoil Charm The Quatrefoil is a symbol of the four Gospels - Matthew, Mark, Luke and John. Ram Charms The Ram is a symbol for Jesus Christ taken from the Old Testament. The ram represents Christ because it is the leader of the herd and also because the ram is a sacrificial animal - reminding us of Jesus' sacrifice on the cross for our sins. Jesus Christ's sacrifice was foreshadowed in the story of Abraham and Isaac. The Ram is a symbol for Jesus Christ taken from the Old Testament. The ram represents Christ because it is the leader of the herd and also because the ram is a sacrificial animal - reminding us of Jesus' sacrifice on the cross for our sins. Jesus Christ's sacrifice was foreshadowed in the story of Abraham and Isaac. Scales Charms Scales are symbolic of judgment and sometimes are used to represent the final judgment. Scales are also associated with the Archangel Michael. Scroll Charms A Scroll can represent the names of the elect, thus serving as an eschatological symbol of the Day of Judgment and eternal life. It is also symbolize the writings of the Old Testament. Shamrock Charms The Shamrock is a symbol of the Trinity. St. Patrick would use a Shamrock to explain to unbelievers how God is One God in three Persons (God the Father, God the Son, and God the Holy Spirit). St. Patrick would hold up a shamrock and challenge his hearers: "Is it one leaf or three? It is both one leaf and three. And so it is with God".